There's now an easier way to get to London City Airport! Pick up or drop off a DriveNow in the on-site parking 24/7 and forget worrying about tracking taxis or hauling heavy luggage around. Take a car from right outside your home before setting off for your holiday or business trip, and then find a car in the app while you pick up your bags before heading home. DriveNow cars are parked in allocated bays and we cover the cost of parking so there's no need for a ticket! There are allocated DriveNow parking bays at London City Airport so you can pick up or drop off a car before and after your trip without needing to worry about parking tickets, or fuel and insurance costs. Find and reserve a car nearby in the DriveNow app, then drive yourself to London City Airport. Park the car and catch your flight - stress free! After you've landed at London City Airport, find and reserve a car in the app while you're picking up your bags. Walk to your DriveNow car in the on-site parking and drive home in comfort. The simplicity of this process removes the middleman and puts you firmly in control, as you would be driving your own car – with the added bonus that there are no second thoughts after leaving the car at the airport. The cost starts at just 33p per minute so no more extortionate taxi fares! 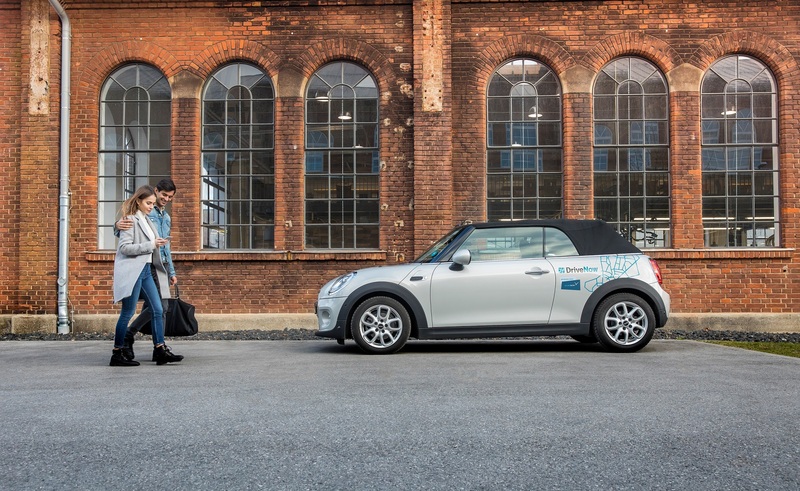 You can also pick up and drop off cars at the airport in most European cities DriveNow operates in. Find out more. Start your rental in the DriveNow Zone (Westminster, Tower Hamlets, Southwark, Barnet, Brent, Islington, Hackney, Haringey and Waltham Forest). Find and reserve a BMW or MINI right outside your home with the DriveNow app, walk to the car and drive yourself to London City Airport. Park the car in the on-site parking (no need for a ticket), and set off stress-free. A small £2.50 airport drop off fee will be added to your invoice. No information desks, no harassment, and no confusion. Reserve a car with the app while you're waiting for your bags, walk to the on-site parking and find your car. You'll need to end your rental in the DriveNow Zone in London where you can park in any residents' or pay and display bay for free. A small £2.50 airport pick-up fee will be added to your invoice. Located just 7 miles east of the City of London and the closest airport to Central London, London City Airport claims to be the UK's leading business airport serving over 40 destinations across the UK, Europe and the USA, with connections to the rest of the world through the major European hubs. With an airport so conveniently located and a car sharing service in operation in the immediate vicinity 24/7, airport transfers in London have never been easier. Whether you're off on a long holiday or going away for a day on business, you can find the right BMW or MINI for you at the right price - a stylish compact car, something with more luggage space, or an all-electric vehicle. Travel to and from the airport in comfort and style with fuel, insurance and parking included in the rental cost.